Dan Cong is a very old tea which history record dates back to 900 years ago. The tea plants are believed to be a specimen of the Shui Xian strain that have been carefully selected to breed as Dan Cong's tree, which is a single trunk tree that rises tall and straight up, and with branches that open out like an umbrella. Feng Huang Dan Cong was also an Imperial tribute tea during the Song dynasty. 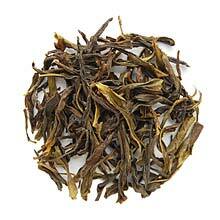 The dried tea leaves of Feng Huang Dan Cong are very aromatic even before they are steeped. The infusion yields a beverage that is sweet with a peachy flavor reminiscent of a popular fruit in China called longan. Slightly curled, long golden-brown tea leaves.